Upgrading your classic Aston Martin is something that’s been synonymous with RS Williams Ltd since our conception 1968. If you require more responsive feedback from your car’s handling or more bite from your brakes, our brake and handling packages will be ideal for you. For those looking for more power, we have some astonishing engine conversions available to raise your car to modern performance standards. Contact us for details on our DB4/5/6 4.2 and 4.7 litre upgrades and our V8 5.7 and 7 litre upgrades. With over 45 years of engineering and motor racing experience with Aston Martins, the name Richard Stewart Williams is synonymous with performance – performance that has been demonstrated from club and historic racing through to the Aston Martin factory World Sports Car Championship effort including the Le Mans 24 hours. Our 7.0 Litre engine conversion is offered in 3 different configurations. Of course they all run on unleaded specification fuel. When your engine is converted in our workshop everything is carried out in-house, from the removal of the engine through to the machining, balancing, reassembly and testing. Now is the ideal time to carry-out engine bay cosmetic enhancements. Each engine is assembled in our clinically clean engine build shop using only the best components; Cosworth pistons, Carrillo con-rods and nitrided steel crankshaft. After assembly the engine is installed on our dynamometer, run in and power-run to optimise carburetion, ignition timing and other variables. Customers are welcome to view any of the work being carried out but we strongly recommend they don’t miss out on seeing their engine undergoing dynamometer testing. The package includes upgrades to engine mountings, differential mountings and differential carrier. Take a look at power output graphs for 7-litre manual and auto below. 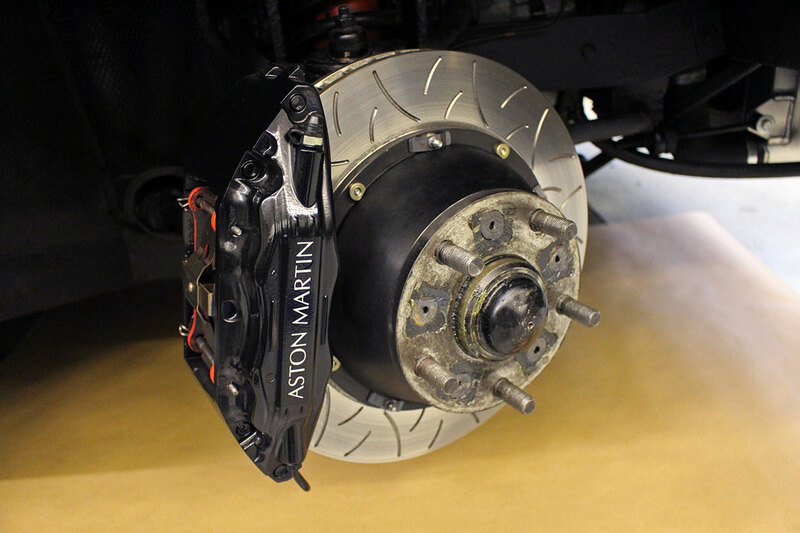 We also offer the optimum braking packages for your car to provide the ultimate in stopping power within the constraints of the car’s original wheels and appearance. After fitting the engine to your car we carry out an extensive road test prior to handover. Using this unique development experience, we are proud to offer our customers various options to improve their six cylinder cars. All engine conversions include the necessary changes to run on unleaded fuel. Each unit is run in and then power-tested on our dynamometer prior to installation. Take a look at the power output graphs for our 4.2 litre and 4.7 litre engines below. Our 4.2 litre upgrade puts out 290 bhp and 295 lb ft while our 4.7 litre unit packs a mighty 330 bhp and 335 lb ft.
We also offer some superb handling and brake upgrades to cope with your car’s added performance. To discuss your requirements, further please contact Neil Thompson. Using this unique development experience, we are proud to offer our customers various options to improve their handling. Over the years customers have requested that we upgrade their suspension and brake systems on all Aston Martin models from DB4 onwards. We offer one handling kit specifically designed for DB4/5/6 models and another for all V8-engined cars. These kits include uprated road springs, Koni shock absorbers, front anti-roll bar and, on the V8, a rear anti-roll bar. Our kits improve road holding whilst retaining an appropriate degree of refinement in ride quality. If you wish to improve your car’s handling further on 6 cylinder cars, we can carry out our Roll Centre and Bump Steer modifications; this dramatically improves front-end turn-in. Also available is a rear Koni conversion for the DB4/5/6 range. We can supply improved discs and calipers; the V8 conversion incorporates Brembo calipers whilst the 6 cylinder upgrade utilises modified Girling 3 piston units. For V8 cars, if your vehicle still runs the original lever arm shock absorbers we can convert it to Koni telescopic dampers (an Aston Martin supplied kit). Please contact us to discuss your requirements. All the above can be fitted in our workshops or supplied from our Parts Department. A Dynamometer is an essential part of any engine builder’s equipment. We have installed a Superflow 901 in our environmentally controlled test room. Every engine we build is run-in on our dynamometer on a pre-programmed computer-controlled alternating load and speed under the watchful eye of the operator in the control room. When the unit has been run sufficiently it is power run and optimised. The computer then generates a graph, a copy of which the customer keeps as part of their car’s history. Click here for an example. Our dynamometer is regularly used by other engine builders to test their own engines; these include other marques. Please contact Neil Thompson to discuss your requirements.